1. The diamond wire rope has directivity, and it should cut along the direction showed as arrow “→” always (as picture below). If reversely cutting, the diamond wire will be shorten in cutting life, even broken. 2. Before connecting the two ends of the diamond wire rope , please wind it 3-5 circles per meter（for the new wire you can twist 2-3circles per meter） along the direction of inner steel rope tension(counterclockwise) (as picture below- it will strengthen the inner rope not loosen it)　(for example:50m wire rope, you want to wind 3 circles, you can wind from one side 150 circles or 75 circles from two sides-total 150circles-Fig. 2 ) . Warning! After having wound the two ends “A” and “B”, holding them strongly in order as not to let them unwind, use the joint and press accordingly. When the diamond wire rope is cutting, the diamond beads will rotate at its axial direction, which will make the diamond come out evenly. If do not wind the diamond wire rope or wind in less circles before connecting, the wire rope will not rotate and just cutting always in that side upon the stone, which will shorten the cutting life of the wire. When single-side attrition occurs, the condition has been beyond retrieving, even if wind it again. 3) Make sure that the two extreme ends of the diamond wire rope are well prepared as previously described (Fig.5) and they fit perfectly inside the joint (Fig.6). Don’t allow any water or mud to get in between joint and wire. Otherwise it would cause a breakage in the diamond wire rope after only a few minutes of cutting. 4) With the special press “Hydraulic Presser”, make 4 cross-presses on the joint, the first two in one way, then turn the joint 90° and do the other two as shown in Fig.6. Make sure not to make it small in the middle but big at the sides, which will make the steel wire rope come away easily and damage the diamond wire. Warning! It is extremely important to change joint every 8-10 hours of work. Cut the diamond wire rope at point “A” and “B” as indicated in Fig.7 and proceed connecting as above (shown in Fig.3-4-5-6). Note! Make sure the diamond wire rope works in the rubbery groove of flywheel. 4. The diamond wire rope needs enough water to cool while cutting, and dry cutting or less water will make the diamond wire rope broken. But, more water is unsuitable, which will put a resistance to the wire, and cause the electric current rising, making cutting efficiency lower. 5. The line speed should be different according to the different characteristics of the stone. 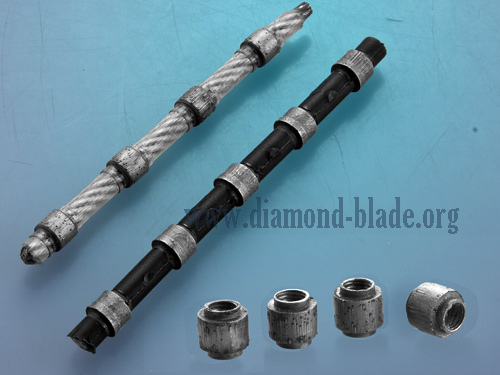 According to years’ experience, for granite: 18-30m/s,for marble: 30-40m/s, for concrete:15-25m/s .Proper tension is needed when cutting, too strong will broken the diamond wire saw, while too week will make cutting efficiency lower. Customers can choose proper line speed and tension according to experience to make sure best cutting efficiency and cutting life of diamond wire. 6. It is better to stop the machine every four hours and check the diamond wire rope. If the diamond beads were broken, wire degums or has any other problems, please cut off and reconnect the wire rope to prevent partial failure causing the broken of the whole diamond wire. This moment, as above NO.2 mentioned, wind the diamond wire before connecting will make the beads rotate at its axial direction and prevent it just cutting always in that side upon the stone. 7. When the rubber coated breaks, the diamond wire rope may come off at a high speed, which may hurt people, so precautionary measures are needed, such as put some baffles around where the beads and springs may reach. Please do not cutting when there is not precautionary measures! 8. Any other problems occurred when cutting, please contact the diamond wire rope manufacturer. ChinShine is one responsible diamond wire rope manufacturer and always strict at the quality, he keeps quality guarantee. He has various formula for the diamond wire for different stone, concrete in different countries, although its diamond wire has been tested successfully in many countries, If customers are not satisfied with the quality or its life, he can still make another diamond wire rope to you as free, the formula of the new diamond bead will be adjusted according to your comment(overcome the fault of your manual operation and the improper machinery operation).